This was my second visit to this place, with the first about a year before I started this website. At the time I was particularly struck by one of the comments in the visitors’ book – “Good on you for your efforts”, which really sounds as though someone incapable of giving false praise was desperately trying to think of something positive to write while the kids were watching on. Old Hobart Town was the creation of John and Andrew Quick. 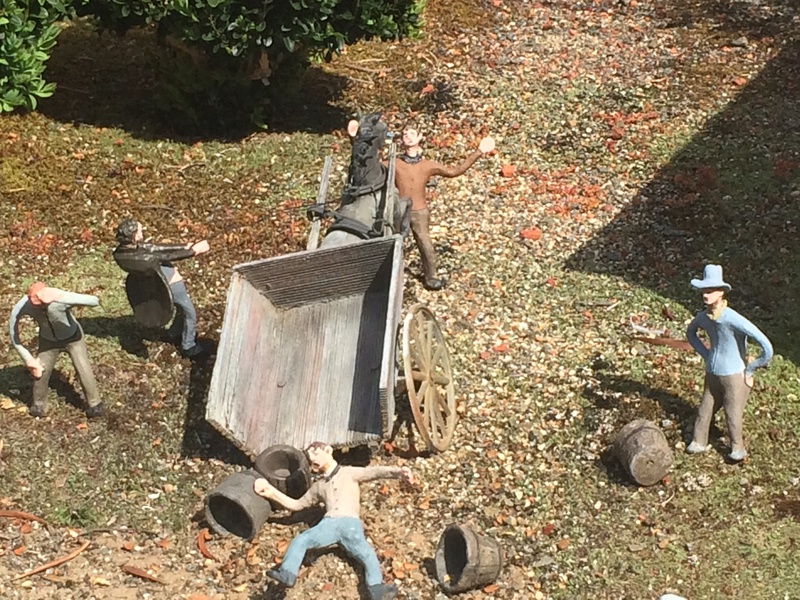 It has offered a 1:16 scale glimpse of Hobart in the 1820s for a couple of decades now, and no-one does floggings, hangings, boozing and urination in model village form like these guys. Fans of miniature clay debauchery, crime and punishment need look no further – it is all right here. 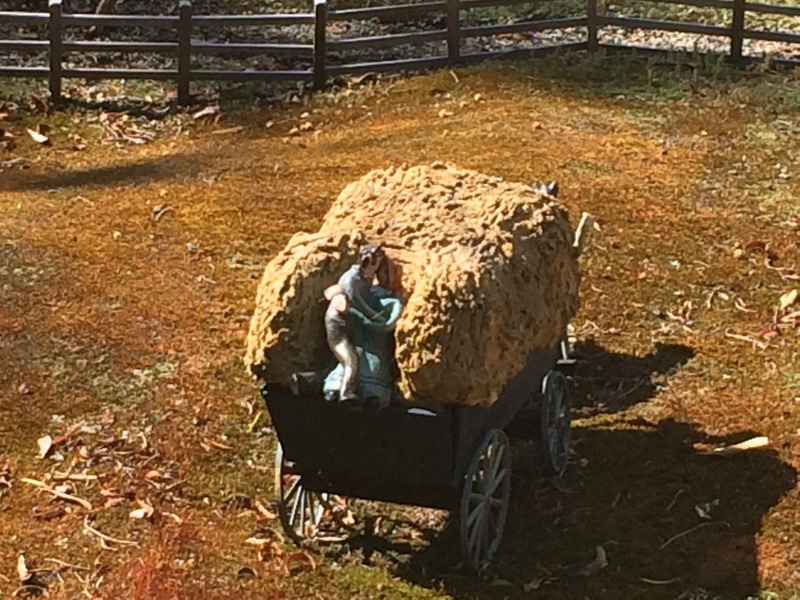 Even the “find the clay figure doing a particular thing” tasks for the kids are a little darker than the average. But your kids should have fun tracking down the man skinning the kangaroo, the lady killing the snake, the boy falling out of a tree and the Tasmanian Tiger (now extinct, obvioiusly). Hey, they were tough times. There is drama aplenty in some parts, but other sections of Old Hobart Town are much more peaceful and reflective. And the range of emotions the Quicks have managed to capture on a series of blobby clay figurines is actually remarkable.Not bad for a model village which you can technically circumnavigate in about 90 seconds. There’s the casual savagery of the colonial soldier, the quiet reflection of the fisherman on Hunter Island, and the couple doing the tourist thing as they gaze down at the water over the side of the Lady Nelson tall ship. A human chain of convicts is leaping over the prison wall, and they will no doubt be beaten senseless and thrown into solitary when the guards catch up with them – either that, or a grim trans-Tasman journey on foot will ensue, featuring desperation and probably cannibalism. Over at Kearney’s Dairy Farm (below right), the Kearneys are in trouble. It looks like those cows have tasted human blood. Mr Kearney is flailing away on the hillside trying to look menacing, but I don’t think the cattle will be lowing this Christmas, Kearney. Mrs Kearney is cursing the misshapen lump on her shoulder – she really should have had that seen to – and wishing she had taken a stout frying pan with her when she went into the fields today. If only she had noticed that one of the cows had been learning how to balance at a 45 degree angle, she would have realised that something was very, very wrong. Personally I thought Old Hobart Town was great. My only disappointment was that when my partner met me in the gift shop (she had already seen it the first time round), they wouldn’t let her use the toilet in case she managed to steal some viewing time on the way through. 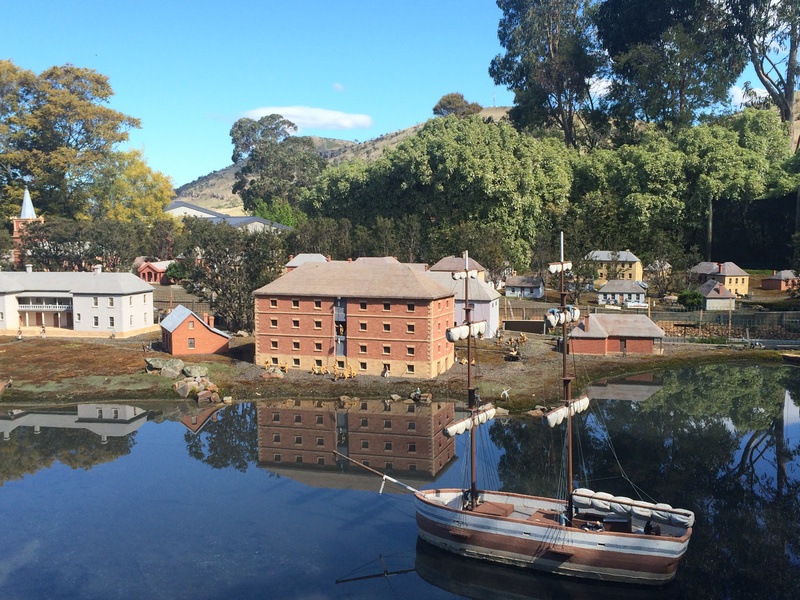 Old Hobart Town is a bit like the colonial model village equivalent of Pixar – the kids will enjoy the fun, and adults should get a laugh at some of the unexpected things they find there.